On February 8 in Crownsville, student teams representing Maryland Institutions of Higher Learning presented their work to the Sustainable Growth Commission’s (Commission) Education Workgroup as part of the Sustainable Growth Challenge (Challenge). The panel of reviewers, which included representatives from state government, private industry, and Maryland communities, engaged with students and their proposals asking follow-up questions about projects ranging from neighborhood development planning to innovative architectural design. Students, along with supportive faculty, submitted work completed in 2017 for consideration. The proposals demonstrate how lucky Maryland is to have young academics who combine passions for learning and their communities. Through the Challenge, the Commission engages Maryland college students in developing creative solutions to sustainable growth while also providing them with a career-building, real-world learning experience. It is an interdisciplinary exercise promoting economic development, environmental stewardship, and sustainable land use at the community level. The Education Workgroup began reaching out to colleges in the summer of 2017 to inform them of the project and encourage participation. 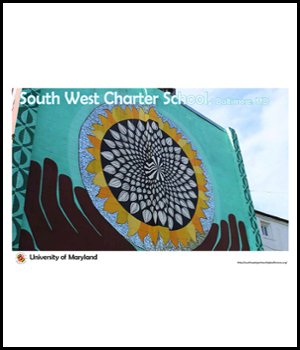 This project applied a thorough analysis of the topography and assets of a charter school in Baltimore’s Pigtown neighborhood to the creation of an interactive learning environment. Through collaboration with authorities and students at the charter school, the project team developed a stunning and integrated site plan which will help the school apply for grants. The detailed approach is quite impressive, and the results will encourage students to interact with their school environment and advance healthy, active lifestyles. Using a tightly structured process, this proposal for Harford County’s Edgewood Recreation Center formulated a development plan for an outdoor gym, including workout equipment. The facility would be free to all park users; enhancing access to healthy activity. The review team commends the group for the significant amount of outreach it conducted in the completion of this project, and for creating a final plan that is readily implementable. Project winners will present their work at the March 26 Commission meeting in Crownsville. Students and faculty representing other recognized work are also invited to attend and set up stations where they can display their work and interact with Commission members. The Commission will invite deans and presidents from participating institutions to attend. Finally, the winners will join recipients of the Sustainable Growth Awards at their ceremony in the spring of 2018. The Education Workgroup looks forward to next year’s Challenge and the excellent work of Maryland’s students. To learn more about the Sustainable Growth Challenge, please contact Joe Griffiths at joseph.griffiths@maryland .org or 410-767-4552.